This 2 stone Iris Flower Ring begins and ends with 2 offset, 8mm Trillion cuts stones that are surrounded by 1mm stones. 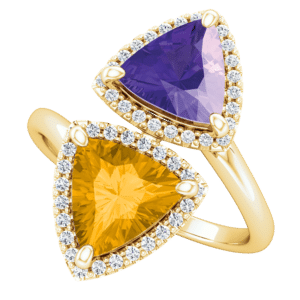 The richness of purple Amethyst contrasts well with the Citrine, with the yellow gold adding a regal richness. The stone shape, size, and color can be played with to suit your taste if you don’t care for Irises. It doesn’t even have to be a floral ring if you don’t want it to be! ACCENTS: Around 1/3 TCW at 1mm. Larger stones can be used, but due to the size, these can only be Diamonds, CZ, Emerald, Ruby, and Sapphire. The listed price is for a Sterling Silver 2 stone Iris Flower Ring with CZ. Contact us for alternate pricing options. Click HERE to see another 2 stone ring design or contact us with your 2 stone Iris Flower Ring idea.